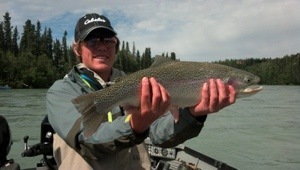 July rainbow trout fishing has been excellent on the Kenai river. Fishing Behind all the sockeye anglers has been the ticket here lately. I’ve been running a 9′ leader with flesh or egg patterns and picking up fish through put the day. There is a lot of food in the system now and it should only get better as the season goes on! 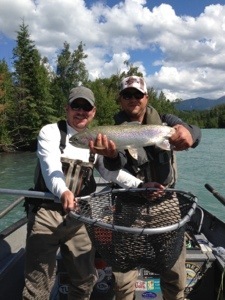 Give us a call and we will do our best to put you on a big Kenai river rainbow trout!